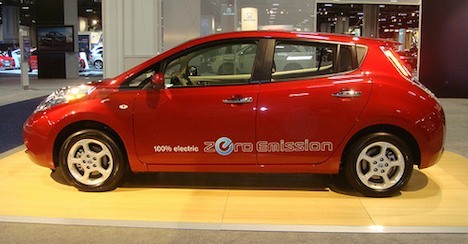 The Nissan Leaf, the world’s first mass-produced electric car, has won the 2011 World Car of the Year award at the New York International Auto Show. LEAF stands for “Leading, Environmentally Friendly, Affordable, Family car”. The runners-up for the award were the Audi A8 and BMW 5 series. The Chevrolet Volt won the 2011 World Green Car award. The winning vehicles at the New York International Auto Show are picked by an international jury made of of 66 top auto journalists from 24 countries. Apart from being the world’s first mass-produced electric car, the Nissan Leaf takes about 8 hours to recharge on a 220-240V power supply and produces zero tailpipe emissions. It has a maximum speed of 90 mph (145 km), but Nissan has said it can reach 100 mph (161 km) on full charge. Along with the 2011 World Car of the Year award, the Nissan Leaf has won the 2010 Green Vision Award and the 2011 European Car of the Year award, and rates as the most efficient EPA certified vehicle for all fuels ever mass-produced. Yes, I know about this news. This is one powerful Electric model from Nissan and comes with so many modern features. Good info shared by you.